Every year, there are two equinoxes, one in the fall and one in the spring. 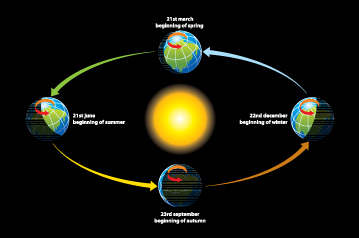 In the northern hemisphere that we live in, the fall equinox occurs between September 22nd -24th. The September equinox happens when the sun crosses the imaginary line called the equator. Many people consider this to be the first day of the fall season and many cultures around the world hold feasts and festivals to mark the September equinox. Go for a walk to see what changes are taking place in your school neighbourhood. Ask: Are the trees changing? Is the air changing? What do you think the animals are doing to prepare for winter? Have students gather some treasures of fall. Take along a bag to collect colourful leaves, acorns, seeds, etc., and then invite students to get creative with them. Find out when the autumn equinox will occur where you live here. Ask students: What causes the seasons to change? What changes do you and your families need to make as seasons change? Learn more here. Have students work in small groups to find out why the leaves change colours in the autumn. When they have finished their research, make a group collage of autumn colours and share with the class.